During this year the first phase of the restoration work has been largely completed. 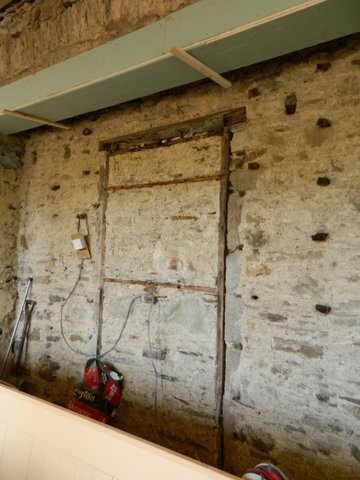 This has involved inserting a steel beam to support the archway in the North Wall and further supporting steelwork to secure the beams of the balcony above the archway. This has enabled the balcony to be brought back into use. 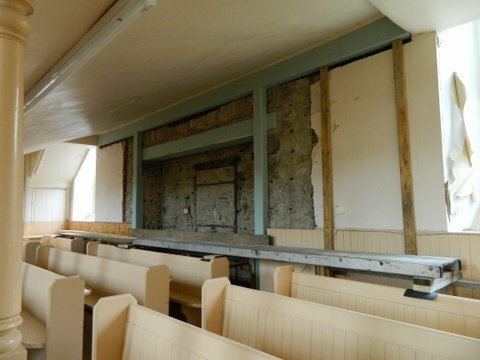 Removal of lath and plasterwork revealed the interior of the closed-off original doorway, which predated the fixed pews on the ground floor. Also revealed on the back of a piece of the woodwork were the signatures of Donald McLean and D McLean with the date 16th April 1895, providing confirmation that the original 1826 doorway was taken out of use prior to that time. Discussions are still to take place about possible reinstatement of this entrance. In the meantime the wall has been draped until the next step has been decided. The Kirk Session have invited Craignish Primary School to begin thinking about a time capsule to be put in the wall before it is finished off. The photos show the closed-off original doorway and the new steelwork. (clad with blue fireproofing).